Of the many plant foods that provide umami in western tradition, the tomato is foremost. Its attractive, full, rounded ‘meaty’ flavour comes from its heavy load of glutamates, and this flavour is reinforced by its unique crimson colour, the colour of blood which is the very essence of animal life. The umami theme remains constant, though the way it is expressed varies from culture to culture. Beginning in Asia with fermented soybeans, migrating through England with walnuts and mushrooms and emerging triumphant with tomatoes in American ketchup, evidence of a deep-rooted worldwide inclination to exploit glutamate-rich foods for savoury seasonings and condiments is clear. Tomatoes contain high levels of the umami provider glutamic acid, and as the fruit ripens these levels increase. There are many recipes that use bright red, ripe tomatoes to make a simple tomato sauce by adding onion and herbs to cooked tomatoes. Most of these recipes, however, involve removing the skin of the tomatoes with boiling water and removing the seeds. However, Heston Blumenthal, owner and chef at the triple Michelin starred Fat Duck restaurant in the UK, began to question this practice of removing the seeds, and wrote an academic paper on the subject in conjunction with scientists at the food sciences faculty of Reading University in the UK. Here, we outline the results of his research. Fourteen types of tomato including four types of salad tomato, six types of baby tomato, three types of plum tomato and one type of beef tomato were analysed. In all cases, the skins were removed in boiling water, the outer and inner (including seeds) portions were separated and each chopped up. 1) Levels of free amino acids, nucleotides etc. were measured. 2) Panellists carried out an appraisal of the taste and flavour profile of the outer and inner part of the tomatoes. 1) The above graph shows the results of the analysis of the umami substance glutamic acid. It is clear that the inner part of the tomato has higher levels of glutamic acid. 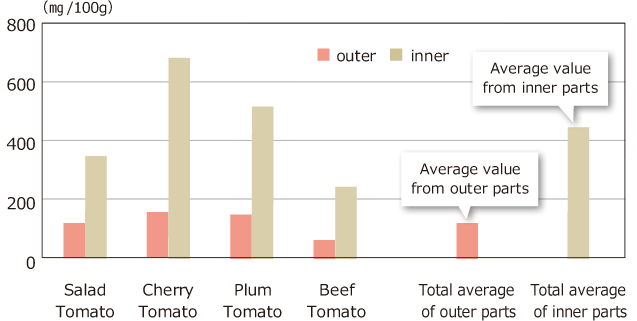 2) The panellists decided that the inner part of the tomato had a stronger umami aftertaste than the outer part (5% significant difference). Tomato sauce is frequently served with meat or fish, which contain the umami providing nucleotide inosinic acid. Thus, the glutamic acid of the tomato combines with the inosinic acid to create a synergistic umami effect, heightening the umami taste sensation dramatically. In this context, it would appear to be even more important to include the inner part of the tomato in sauces. Thus, when making your own tomato sauce, be sure not to throw the seeds away, and make full use of them!